I'm a volunteer for the Perth-based literary magazine dotdotdash. Visit our website at www.dotdotdash.org. You know how if you have no money you tend to sit around moping on a weekend? If you're in Perth you have no excuse – get out of your pyjamas and get to Kings Park and Botanic Gardens. Kings Park is the most popular visitor destination in Western Australia with over 6.5 million visitors each year. It is a very large park, with 400.6 hectares of land. The majority of it is bushland, containing over 300 species of native plants, but large chunks are gardens bursting with purples, reds, blues and greens. Throngs of people walk the garden paths in groups or pairs, or jog solo with earphones dangling under their chin. Many picnic rugs are spread out over green expanses of flat land. 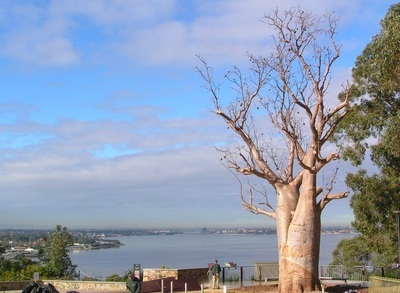 The Park overlooks the Swan River and the Darling Escarpment, making for breathtaking views of blue sky, extensive suburbs and purple mountains, and there are multiple lookouts along the river for exactly this purpose. As the sun sets over the lookout the sky melts into red and then pink, darkening gradually, and everything becomes hazy, like one large blue-black shadow. The State War Memorial, a grey stone tower surrounded by a sea of flowers and silhouetted by the Swan River, was erected in the Park in 1929. The Anzac Day service is held here each year, with thousands of people turning up for the dawn ceremony to place flowers around the grey structure in remembrance. A lot of visitors spend a few silent moments in front of the memorial; it is a sobering monument in an otherwise relaxing and frivolous atmosphere. The famous Federation Walkway is currently one of Kings Park and Botanic Garden's most popular tourist attractions. It extends through the Botanic Garden along walkways and glass bridges that hang 52 metres above the ground. The promise of a golden-green view entices many tourists to walk amongst the treetops. On a weekend Zamia cafe is full of chatter and laughter; visitors take advantage of the sunshine and hot coffee. The car park is lined with eucalyptus trees and kangaroo paws. But by far the best part of a day in Kings Park is the night show – twinkling trees all in a row. Fraser Avenue, the street that climbs to the top of the large hill, is lined by lemon-scented gum trees that light up at night to create a haze of colour. They turn from white to blue to purple to pink; one turns red while another stays green, another blue; a moment later the branches are yellow, the trunk purple, the leaves green. It is hard to tell where the lights are; in the leaves? Hanging onto the branches? At the foot of the tree and flashing upwards? They just seem to emerge, blazing bright and colourful. Many visitors park at the top and gaze down at Perth city; at the skyscrapers, blinking red security lights and winding roads sprawling into the distance. It is open quite late and is a perfect spot for stargazing with a loved one. So next weekend – no more moping. A fun, free day awaits you at Kings Park and Botanic Gardens.